Of all the issues that should be making parents of young children and adolescents’ blood boil, it is unrestricted advertising of booze during premier sporting events. Put simply, there are no restrictions beyond self-regulation on alcohol advertising when it comes to sporting events that coincide with children’s viewing hours up to 8.30pm. We’ll come back to saturation advertising during the recent AFL and NRL grand finals as an example of the overreach, some might say overkill, of the alcohol industry. Rob Moodie, former chairman of the Melbourne Storm and a leading public health professional, spoke forcefully on behalf of a majority of Australians when referring to polling conducted by the Foundation for Alcohol Research: “Nine out of 10 Australians agree that children shouldn’t be exposed to alcohol advertising during children’s hours,” he said. The Foundation for Alcohol Research (FARE), which is behind the End Alcohol Advertising in Sport campaign, has proposed what seems like a reasonable solution to the Fifield argument against ending free-to-air television’s addiction to alcohol advertising. On the broader issue of finding alternative sponsorship, you can’t tell me that businesses with deep pockets can’t be found to replace existing sponsors. In the NRL, for example, the value of the most recent contract with Telstra for $6.5 million was more than four times greater than that of the largest alcohol sponsor, Carlton and United Breweries at $1.5 million. Rugby League great Steve Ella, who sits on the FARE board and has devoted a lifetime to working in indigenous communities to alleviate harms caused by alcohol abuse, put the issue eloquently at last week’s End Alcohol Advertising in Sport launch. “The game I love is awash with alcohol promotion. It has become increasingly difficult to know where the game ends and alcohol advertising begins,” he said. In the NRL, saturation alcohol advertising was more pronounced, with 3.3 occurrences a minute during children’s viewing hours. In its exploitation of the exemption in the Commercial Television Code of Practice that allows alcohol advertisements alongside sport, the alcohol industry certainly can’t be accused of looking this gift horse in the mouth. 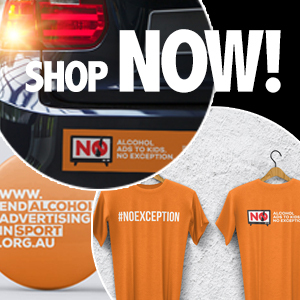 Almost 50 per cent of all alcohol advertising is shown during live sporting events. “The more alcohol advertising young people are exposed to, the earlier they will begin, and the more they will consume if they already drink,” according to an Oxford Academic study. This post was first published on The Sydney Morning Herald.